We Can Do It! Now more than ever!! One of the most popular and recognizable images created during WWII was that of Rosie the Riveter. The original poster was commissioned by the War Production Coordinating Committee to boost morale among female production workers. 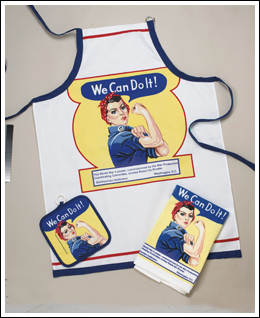 These cotton/poly, machine washable items will boost YOUR kitchen morale and production.